The Hemet/San Jacinto Valley Gang Task Force is one of eight teams composing the Riverside County Regional Gang Task Force, which is a collaborative effort of 25 law enforcement agencies with the goal of combating criminal street gangs. The Hemet/San Jacinto Valley Gang Task Force is committed to creating safe and secure neighborhoods free of violent crime and gang activity. This is done through a collaborative effort combining peace officers, probation officers, parole agents, federal agents, and prosecutors whose common objective is to provide targeted intelligence gathering, enforcement, investigation and vigorous prosecution of gang members engaged in criminal activity. The Hemet/San Jacinto Valley Gang Task Force also collaborates with school districts, community organizations, and the District Attorney’s Project Safe Neighborhoods program in providing education, intervention and prevention support. Eliminate violent gang crime within our communities through aggressive enforcement, intelligence gathering, and investigation. Vigorously and effectively prosecute gang members charged with illegal conduct. Prevent local youth gangs from becoming criminal enterprises. Enhance the communication of gang intelligence information between all participating agencies. To provide intervention training to “at risk” youth. 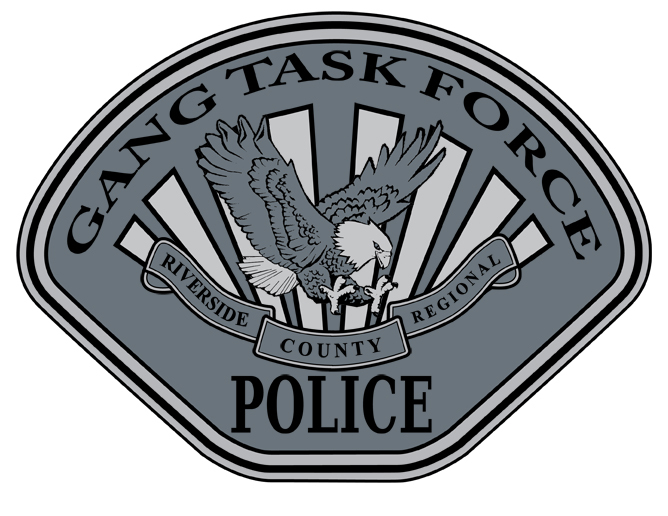 The Hemet/San Jacinto Valley Gang Task Force is one of eight teams composing the Riverside County Regional Gang Task Force, which is a collaborative effort of 25 law enforcement agencies with the goal of combating criminal street gangs. The Hemet/San Jacinto Gang Task Force is supervised by Hemet P.D. Sergeant Bob Nishida. The Hemet/San Jacinto Valley Gang Task Force is staffed with members of the Hemet Police Department, San Jacinto Police Department, Riverside County Sheriff’s Department, Riverside District Attorney’s Office, Riverside County Probation Office, and the California Highway Patrol.